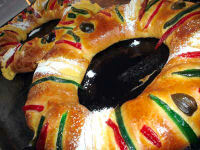 Brighten your Twelfth Night as Mexicans do, with this bread. They say the person whose piece contains an enclosed coin or little doll must give a party on Candlemas Day - February 2. 1. Soak orange peel in rum about 30 minutes. Dissolve yeast in warm water. 2. Heat milk, sugar, butter, and salt to warm (105-115 degrees). 3. Add 11/2 cups flour, eggs, yeast mixture, and the rum-soaked orange peel. Mix thoroughly. 4. Add enough remaining flour to make a soft dough. Knead on lightly floured surface until smooth - about 10 minutes. 5. Here you insert coin or doll if desired. (Just warn your guests!) Roll dough into long rope. Shape into a ring and seal ends together. Place on greased baking sheet. 6. Cover; let rise in warm place until double - about 1 hour. 7. Bake in a preheated 350 degree oven 35-45 minutes or until done. Cool on wire rack. 8. Frost with icing and, if desired, decorate with candied cherries or orange peel.